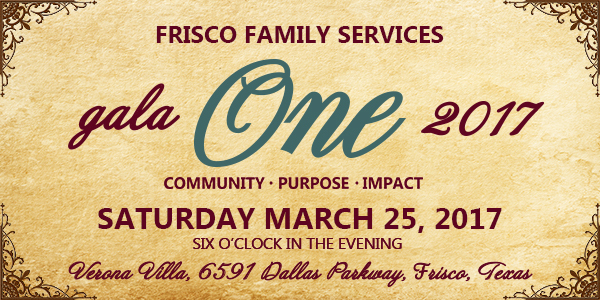 Frisco Family Services is pleased to announce Gala 2017- ONE, which will be held on Saturday, March 25, 2017 at 6 p.m. Our annual gala represents ONE community, coming together for ONE purpose, having ONE big impact. This year's event will bring the spirit of Italy to Frisco as guests join together at one of the newest and most stunning event venues- Verona Villa. Verona Villa is constructed with beautiful Italian stones and truly captures the essence of Tuscany. The evening will include a multiple-course tasting, presented by some of the area's finest dining establishments, as well as live music from the energetic Downtown Fever Band. An incredible live and silent auction will present guests with the opportunity to take home one-of-a-kind items and bid on unique travel experiences. Gala 2017- ONE will conclude with the announcement of the winner of our raffle prizes! Gala 2017- ONE directly supports the mission of Frisco Family Services, bettering the lives of our neighbors who are facing hunger, homelessness and other urgent needs to improve their quality of life and achieve self-sufficiency. Be a part of a COMMUNITY that CARES, and CHANGE LIVES today. Below you can see the many ways you can support this year's gala. We hope YOU will be a part of Gala 2017- ONE! *Thank you for your interest in sponsoring Gala ONE 2017. Our event is currently sold out. If you are interested in learning about other ways you you can support the gala through our Fund-A-Need or purchasing raffle tickets please contact Karissa Mead at 972.335.9495. There is also a great opportunity for community partners to sponsor our upcoming Mayor's Golf Classic which will be held on Monday, June 19th. To find out more about sponsoring our golf tournament click here. Click here to learn more about the Gala 2017- ONE Raffle Prizes! Check-Out the fun we had at last year's gala on our Facebook page!